I was sitting in a pub during my lunch break on Monday, and whaddaya know, New Radicals comes on with their smash (one-hit) single “You Get What You Give.” Figured it was time to look through my iTunes library and see what 1998 had to offer. It was the unfortunate demise of an iconic Hip Hop group you may have heard of, A Tribe Called Quest and the entrance of another; the Gorillaz. We met a blonde teenager named Britney Spears, and said goodbye to a legend, Frank Sinatra. Formed in 1998, this L.A. alternative rock group didn’t last long in the industry but caught some fame with this song being overplayed everywhere you went, including multiple movies and trailers. Off one of my favourite Gang Starr records. Premier and Guru really are something else. Soul Survivor is the debut solo album from Mr. Rock. This all-star cast features Ghostface and Rae of the Wu and Prodigy of Mobb Deep. 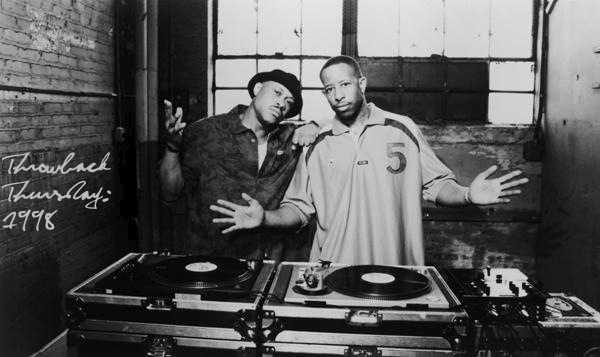 Check out this great read on Premo & Pete (via theHue). Featured on the Dr. Doolittle soundtrack, this deep, infectious beat was a tag-team production from Timbaland and Static Major with a short Prince sample. Off Foundations which served as the comeback/reunion album of the original four. Something About Airplanes is the debut album from the Seattle indie rock group. 14 years later and they’re still going strong. On the Grammy-winning Vol. 2…Hard Knock Life. Produced by Irv Gotti and Lil Rob. This Grammy-nominated song found it’s way into many movies and television series, and isn’t stopping. Most recently, a throwback in Reunion and played a prominent role in Friends With Benefits. There was a time where this track left my Sony Discman stuck on repeat. Produced by Swizz Beatz. This track is a product of a one-time musical collaborative French trio. Off the final and arguably worst record from the iconic group. It served as the end of an era. Found on Tiësto’s Magik Three: Far From Earth compilation record. This was the first track to ever get my into the Dutch DJ. Featured on their fifth studio album Hello Nasty. The music video was directed by the late MCA. It took the Buffalo rock band 5 albums to gain traction in the States and 6 for the rest of the world to jump on the train. Dizzy Up The Girl went 3x platinum. 5x Platinum and originally recorded in 1992 but wasn’t released until after Pac passed away. Too bad he wasn’t around to see America received their first African-American President. Capital Punishment is the solo album from the Big Punisher (R.I.P.). It was a well-receivd album and went platinum. This title-track is featured on the Scottish group’s third album. The album title is named after another Scotland-based group called Arab Strap. Part 1 was chosen as a single, but i’ve been more favourable towards Part 2. Aquemini (Big Boi is a Aquarius, André a Gemini) is the hip hop duo’s third release. Once a B-Side, they re-recorded it and it later became a single off the Best Of 1980-1990. The UK singer borrowed an arrangement from John Barry that was used in one of his favourite Bond films.